3DPT would like to congratulate Aidan on being named November’s patient of the month! Aidan: I am a basketball player at Saint Joseph’s High School in Hammonton NJ. 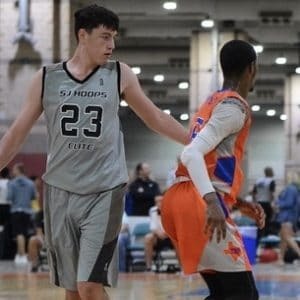 I currently play center, and plan to play basketball in college.My knee started to hurt throughout July during my summer league, and continued in August during basketball camp at Catholic University in DC. It hurt so bad that I could not play or jump. After I got home from camp, I went to the doctor, who diagnosed me with patellar tendinitis. He told me to complete physical therapy, and if that did not help, I would need to get surgery. 3DPT: What was your favorite part of coming to physical therapy? Aidan: My favorite part of coming to physical therapy was taking to everyone. Everyone here is so nice, including the staff, therapists and patients. 3DPT: What goals do you have after leaving physical therapy and in the next 5 years in terms of sports? Aidan: My basketball season starts in about 2 weeks, so I am excited to start playing again after being out for so long. I just committed to Immaculata University to play basketball and to get my nursing degree. 3DPT: What is your favorite thing to eat before playing in basketball games? Aidan: Either wawa, or a sandwich. Aidan: I would recommend 3DPT because the therapists know what they’re doing. I have gone there for two different injuries and both times they have gotten the injury healed so I can start playing basketball. I would also recommend 3DPT because of the extremely friendly staff. It’s always a lot of fun talking and joking around with everyone.